Create balance sheet templates in MS Excel. This software offers a solution to users who want to arrange a balance sheet for personal or home office use. Simply enter numerical data in the sub-categories of assets and liabilities and a convenient chart is generated. This software will save you time by organizing data in a print-ready format. 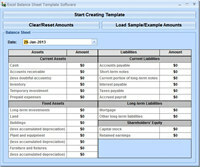 Excel Balance Sheet Template Software is a business program that works under windows xp, windows vista, . Estimated download time for Excel Balance Sheet Template Software on a common adsl connection is less than a minute. Version 7.0 was released three thousand three hundred seventy one days ago by Sobolsoft. Click the green download button to download it now.